You may know that I was an elementary school teacher before I became a yoga instructor, and so I've been exposed to all kinds of children's books over the years. I was introduced to Peter H. Reynolds and his books a few years back and I was instantly hooked. All of his books have a beautiful message to help kids (and adults, as you'll see) feel inspired, believe in themselves, express themselves creatively, and follow their hearts. He has countless books (and you should check them all out), but my personal favorite so far has been The North Star. 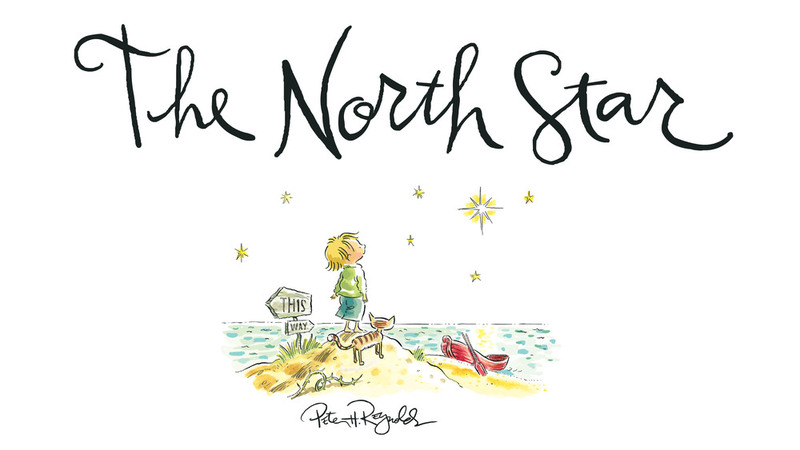 As I was reading The North Star for the first time to my students, I started to get choked up. As I kept reading I realized...this book is meant for me. It's meant for all of us. It's about a boy who starts out early in his life, early in his journey, feeling happy and content. As he grows, a rabbit begins urging him onto "the path" - the path that others have traveled before him. The boy isn't sure why he's on "the path" and it doesn't feel quite right, but the rabbit is adamant - he shouldn't delay, many other people are ahead of him and he doesn't want to fall behind! Over time the boy begins to feel lost...and he's not sure where he is or why he's even traveling this path. Eventually...with the help of a new friend...he finds his way off the path, and learns to follow his true North Star. Now, before reading further - I urge you to read the book yourself. You can check out a virtual copy of the story HERE. It's beautifully written and I definitely didn't do it justice in my summary. It got me thinking about how so much of my life I've been on "the path." Not my path, but the path that I thought I was supposed to be on. The path I thought I should take. We are all born as our true selves. I see this in the young children I teach. Children have a true radiant spirit, they enjoy each moment, they play, they explore, they question, and they don't seem to have inhibitions. They live their truth. It's only until society takes hold of them, and they start to feel pressures to conform, to be accepted, to be liked - that they begin to censor themselves or hide their true selves inside. I think back to myself as a child, when I would play outside, wander in the woods, or lay on the ground staring up at the treetops and taking full breaths, being present in each moment. I also think about those years approaching adulthood - let's call it my 16 year-old-self. This version of myself was still in touch with my truest self. I would spend hours in my room, listening to the radio (making mixtapes!) or the classic rock CDs I would steal from my dad. I'd draw, paint, pastel, color, and otherwise create without caring what other people thought or who would see it. I was doing these things purely out of the joy it created for me. But somewhere along the way, I started to do more and more of what I thought I should do. I did more and more of what I thought was productive, or leading me in a certain "successful" direction. The things I did purely for joy (and no external gain) started to be placed on the back burner. I think I became addicted to "achieving" rather than listening to my own inner guidance regarding whether I even enjoyed what I was doing. Now don't get me wrong, you're never going to enjoy every single minute of hard work toward a goal...sometimes it takes discipline and sacrifice to get where you need to be. But what's the point if the end goal isn't even something you truly want for yourself? I was an artist in high school, and I wanted to go to art school. The first major step off of my own path, and onto "THE path" was when I decided I should forego art school in order to attend Boston University in the College of Arts and Sciences. After all, it wasn't smart to limit myself to just art school - I should have options for more "practical" opportunities. And so I did. I still had a blast and I learned so much as I pursued another passion - psychology. But the artist in me, the creator, was pushed to the back burner for when I had "more time." I continued somewhat off my path for the next ten+ years. And as I traveled (having a lot of wonderful experiences and making connections with amazing people along the way, don't get me wrong! ), I continued to go deeper and deeper into the woods, into the swamp. I had followed the path that was other people's path. But it wasn't fully my own. There were bits and pieces that were mine, but I wasn't allowing my North Star to fully shine its light. I lost myself. After ignoring my North Star for so long, I went through a period of hardship and tragedy, which forced me to start to listen to myself. Through these challenging times, my yoga practice increased, which connected me even further to my inner guidance and my true self. I changed a lot of my habits, enrolled in a yoga teacher training, and changed my entire outlook on our universe. This does not mean that I regret my path. My path has made me who I am today, and I don't regret any of my choices or experiences. However, I finally feel that I am back on my path. I just left my job as an elementary school teacher, and although I miss the kids, I know it was the right decision for me at this time. I know I'll work with kiddos in some capacity in the future; I still can't get enough of their vibrance and truth. (Plus I love building forts and playing outside.) But for now, my truth is pursuing my business of yoga, wellness, and travel. Through these means, I plan to help others on their own journey. I want to help others feel good, feel inspired, and feel empowered to live the life that they want. I want to help others connect with themselves, first and foremost, and to learn to listen to that quiet voice inside. Finally, I hope I can help provide support and community in others doing this work. I'm hoping that this post, and this book, will serve as a reminder to you about how important it is to listen to that voice inside, to listen to your true self. It's also never too late to change your course. You can rewrite your story, starting now. P.S. If you're local and would like to buy this book, consider visiting The Blue Bunny Bookstore in Dedham, MA, owned by the Reynolds family. If you're not local, please purchase the book here! The above is an affiliate link. That means that if you purchase a product I've recommended, I may earn a small commission from Amazon. I only recommend books, products, etc. that I have personally used or experienced, and that I believe will help you change your life! Purchasing through these links helps to support Wander Free Wellness in the mission of spreading healing and self-discovery. Thank you!